Makonga’s fame increased and he must have taken satisfaction in being able to show his parents that he had not been lost to the penurious world of art. He began drawing comic books, and appeared on television and on the radio, receiving visiting artists from France and other countries. Makonga was not completely insensitive to the danger he was creating for himself and his family. But he says that because the world was watching Zaire and the political discussions there, public figures like journalists were in a protected position. That didn’t mean that he didn’t have to escape and go into hiding for having spoken out against injustice, but his family was luckily left alone. 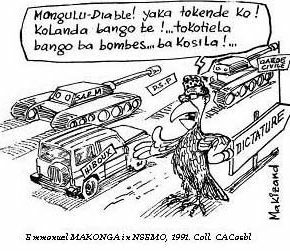 As a political cartoonist, Makonga was able to exercise that quality that makes a great artist, qualities that go deeper than paint and brush. Makonga was able to utilize his vision to generate hope for a people who had known only despair. He persuaded them that there could be an end to mass violence, solutions to the madness of the AIDS epidemic, and hope for the land. He continued drawing his cartoons at various papers and publishing his comic books until the political situation became unbearable. 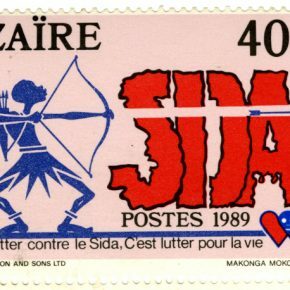 In 1993, while Mobutu was contending with a rival government set up by a conference of various political parties, Makonga left his homeland for Gabon, a French-speaking country on the coast west of Zaire. 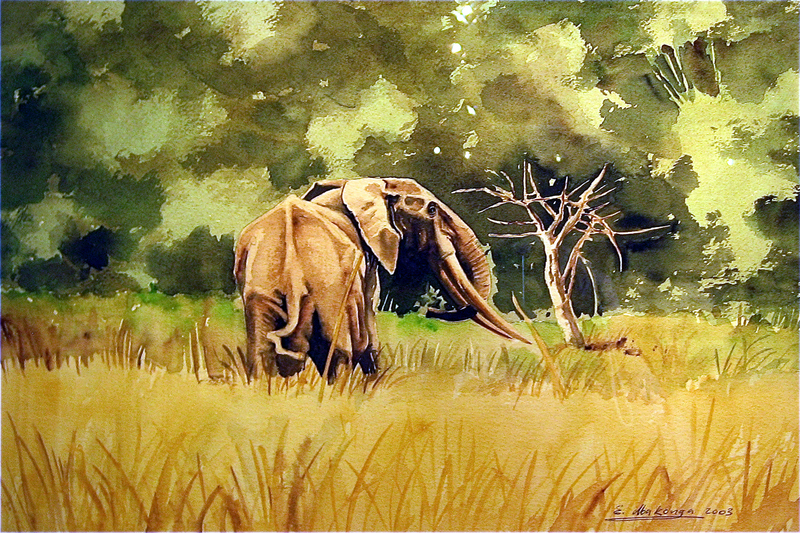 Because of the trouble he had in his native country Makonga wanted to quit drawing when he arrived in Gabon. But his friends and colleagues there naively assured him their country was different, that he wouldn’t have the same problems. In Gabon, Makonga’s energies turned more and more toward larger societal and environmental issues. 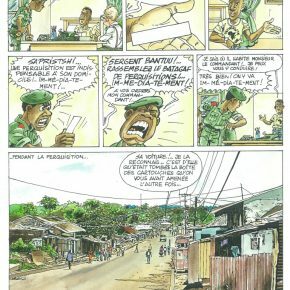 In 1996 the European Union published a collection of his cartoons called Les braconniers d’Afrique, which focused on the environment and is still used in classrooms for young students today. He also published a comic book exploring the life of the Bantu. 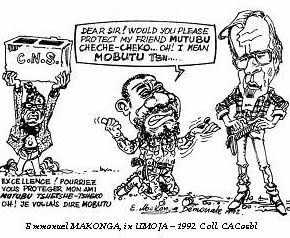 Makonga says he was relatively unmolested as a cartoonist, but when he became an editor and published his own newspaper, Le Nganga (the fortune teller), he ran into trouble with the Gabon government – which had its own long-term, corrupt president. He returned to his homeland, but what was now called the Democratic Republic of the Congo was suffering from years of Civil War and conflicts with neighboring countries, and it quickly became apparent Makonga couldn’t stay there either. 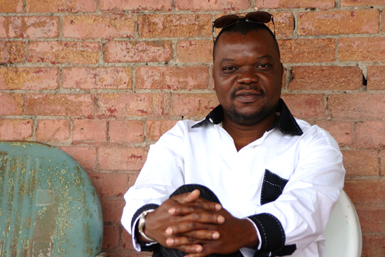 In 2002 Makonga emigrated to the United States, becoming an exile far from his native land living in a place where he didn’t speak the language. Here he had lost all of his celebrity. He wasn’t anyone to anybody. He tried to establish a career as an artist, but when he realized people were trying to take advantage of him he decided to wait until his English improved and he could better understand the system before relaunching his career here. After first living in Ohio, he came to Salt Lake City last year and that’s when he began showing his portfolio around town. At Art Access II Gallery you’ll find none of the political activism that marked Makonga’s early career. What can be seen is a manifestation of the artist’s hopeful vision of another side of the Congo. The images incorporate the best of what Makonga knows to be true of his fellow Congolese and their land. 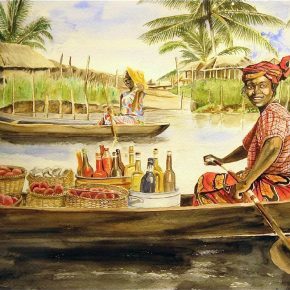 Makonga paints market scenes where villagers gather, bringing fresh produce, and fish mongers who contribute with the catch of the day. He paints beautiful African woman in traditional Congolese costume washing clothing in a stream, enjoying the satisfaction that is the reward of hard work. 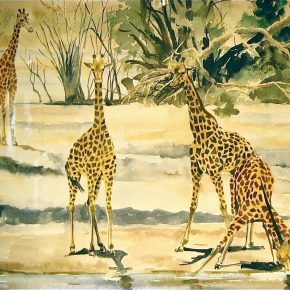 He paints giraffes and elephants that can drink from the pond without fear of poachers. He paints children at play, groups of boats gathered in a cluster in the bay while their oarsmen chatter casually under the midday sun. He paints villages and huts which do not know time. 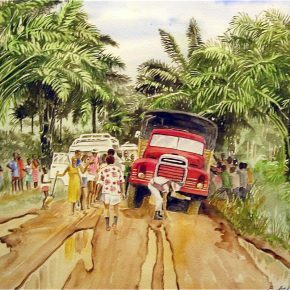 In these watercolors Makonga seems to forget politics and the suffering he has witnessed and uses his vision to transcend all that has plagued his nation. Makonga sees the village as a place of peace, endangered by encroaching modernization. He speaks of the joys of village life. He speaks of villagers in their ’90s who have never seen a hospital, whose medicine comes from the communal herbalist. His vision of his country is abundant with gifts from the land and giving back to the land, enjoying a natural world that is lush and pervasive. The village, he says, is disappearing. 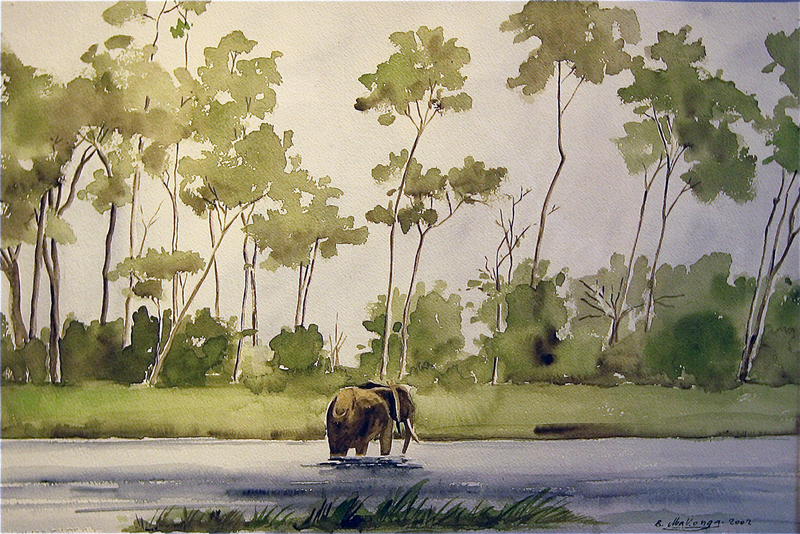 In his paintings he wants to “stop time” and preserve the village for the future generations before the bush is taken over by cities and cars. “It is a style of life that is really important. Really rich,” he says. He also plans on producing political cartoons in the future. He says the recent election in the United States inspired him, but he missed the opportunity to be involved. Emmanuel Makonga’s young desire to become an artist manifested itself in ways he could not have foreseen or planned. His vision has made him not only a great artist but a great man: a leader, an activist, a role model, an educator, and especially a man of vision. By following his impulse to practice what he loves, he has been able to affect millions in the third largest country of Africa. Through Makonga’s artistic talent, his intellect and vision, many people have found relief through humor, and hope, without which nothing is possible.